Fu, S.H., Gasparrini, A., Rodriguez, P.S. and Jha, P. 2018. 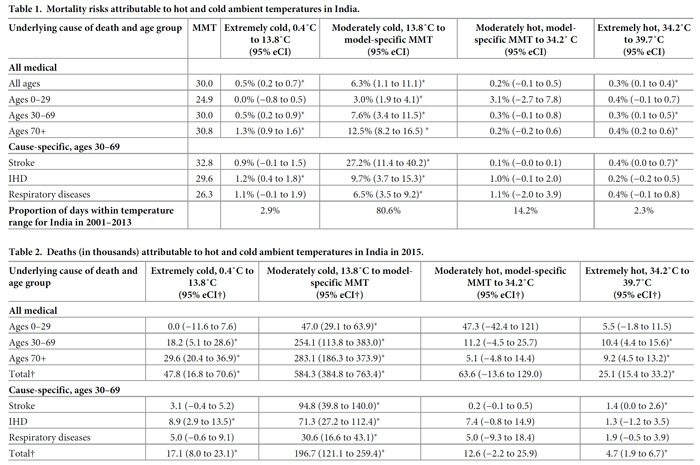 Mortality attributable to hot and cold ambient temperatures in India: a nationally representative case-crossover study. PLoS Medicine 15: e1002619, doi:10.1371/journal.pmed.1002619. Writing as background for their work, Fu et al. (2018) say that most epidemiological studies analyzing the effects of temperature on human health have been conducted in high-income countries, whereas low-income countries like India have not been sufficiently examined. In an attempt to remove this oversight, the four scientists conducted what was, to their knowledge, "the first study to estimate cause-specific deaths attributable to daily hot and cold temperatures in India using nationally representative mortality data spanning a 13-year period." This work involved quantifying the effects of both hot and cold temperatures on "all medical causes of death for all ages, as well as on stroke, ischemic heart disease (IHD), and respiratory diseases among adults aged 30-69 in India." Mortality data to complete the study were obtained from India's Million Death Study (conducted in 2001-2013), while daily gridded temperature data were obtained from the Indian Meteorological Department on a 1 x 1 degree spatial resolution. The mortality and temperature data were utilized in distributed-lag nonlinear models with case-crossover models to assess the effects of heat and cold on human mortality. The results are presented in the two tables below. As shown there, the highest mortality risks and greatest number of deaths attributable to temperature are near-unanimously found in the moderately cold category. More specifically, Fu et al. report attributable mortality risk values of 6.3% for all causes of death at all ages, 27.2% for stroke, 9.7 for IHD and 6.5 for respiratory causes under moderately cold temperature conditions. This is to compare against corresponding attributable risk values of 0.4% or less at extremely hot temperatures. With respect to attributable deaths, values in the moderately cold category were typically one to three orders of magnitude greater than those reported for the moderately hot, extremely hot or extremely cold temperature classifications. And in combining the attributable deaths from all causes (stroke, IHD and respiratory), Fu et al. report they were "12 times greater than deaths due to extremely cold temperature and 42 times greater than deaths due to extremely hot temperature." Clearly, cold temperatures pose a far greater human mortality risk, killing considerably more people than do warm temperatures. Source: Fu et al. (2018). See original text for Table explanation and legend.